Looking for a quintessential English countryside vacation that offers fun, interesting activities for the kids but also charm and romance for the adults? The perfect balance of both can be found little more than an hour’s drive west of London in the Cotswolds. Officially designated as an “Area of Outstanding Natural Beauty,” the 200-mile Cotswold region is famous for its ancient limestone villages, rolling green hills (“wolds” in old English), and bustling market towns that have changed little since the 15th and 16th centuries. Running from the Roman city of Bath in the south to Shakespeare’s hometown of Stratford-Upon-Avon in the north, with the collegial Oxford in the east and the regal Cheltenham further west, there is no shortage of choices for sightseeing. If you only have a few days, however, London-based correspondent, Emily Goldfischer, suggests sticking to the heart of the Cotswolds – Gloucestershire – where you can fill your days enjoying the spectacular landscape on foot or by bike. Here are five attractions not to miss. 1. Westonbirt Arboretum (www.forestry.gov.uk/westonbirt) – With more than 17 miles of paths across 600 acres, Westonbirt—the national arboretum of England—is a wonder. 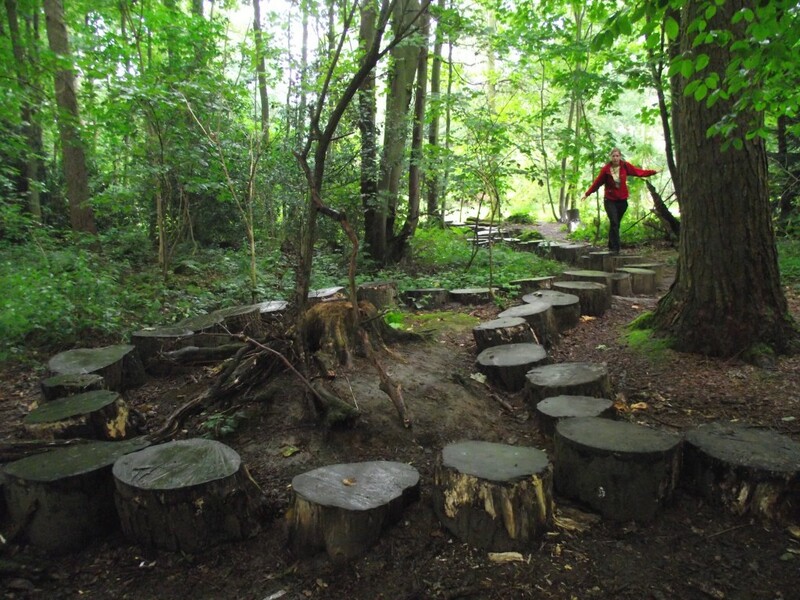 On display you’ll find some of the oldest, biggest and rarest trees in the world – more than 2,000 varieties – all easy to navigate with adventure trail maps. We loved the fort building station equipped with moveable wood planks! The arboretum is located three miles outside of the upscale market town of Tetbury. Filled with antique shops and gastro-pubs, it’s also the location of Highgrove (www.highgrovegardens.com/), the private estate of Prince Charles and the Duchess of Cornwall. The magnificent gardens at Highgrove are open to the public (pre-booking essential) but not great for kids, so for a sample of royalty don’t miss the Highgrove shop in town (www.highgroveshop.com/) with goods produced by Prince Charles’s charitable companies. 2. Cotswold Farm Park (www.cotswoldfarmpark.co.uk) – this working farm gives insight into the region’s agricultural past and is the ultimate countryside experience for kids. They get to see more than 50 kinds of rare-breed animals, hold bunnies and guinea pigs, and even bottle-feed lambs. Demonstrations include lambing around Easter, followed by shearing and milking later in the season. Other excitements include mini electric riding tractors, zip line, jungle gym. Hungry? Grab sustenance at the organic café on-site then drive ten miles to the most fantastic pub in the Cotswolds – The Wheatsheaf Inn in Northleach (www.cotswoldswheatsheaf.com/) —for afternoon tea or an early dinner. Simple, rustic “field to fork” cuisine by Chef Antony Ealy, who formerly cooked for the band U2, features regional meat, game, seafood and produce. Everything was delicious and reasonably priced, from the succulent, crispy crab toast, to the roasted sea bass with gnocchi, to a light, crunchy Eton Mess (traditional English dessert of meringue, whipped cream and seasonal fruit). Kids can enjoy pub classics – fish and chips, sausage and mash, or full roast. 3. Blenheim Palace (www.blenheimpalace.com)– A World Heritage Site, the spectacular Blenheim Palace was a gift from Queen Anne to John Churchill, 1st Duke of Marlborough, following his famous victory at the Battle of Blenheim in 1704. You can visit the gilded State Rooms, which house one of the finest art collections in Europe, and explore the Churchill Exhibition including the room where Sir Winston Churchill was born in 1874. 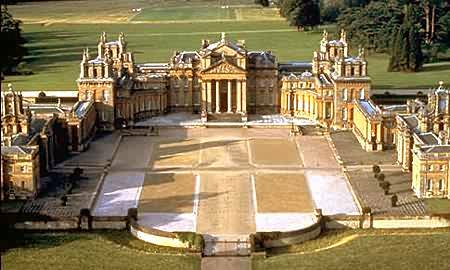 For kids, there’s a “Palace Detectives” hunt within the exhibition displays, but the best part is outside – the 2,000 acres of landscaped parkland designed by the famous “Capability” Brown with lakes, formal gardens and a pleasure garden that houses The Marlborough Maze, the world’s second largest symbolic hedge maze. It covers an area of just over an acre and has wooden bridges, which provide perfect vantage points. Within the maze area is a model village, putting greens, as well as a giant chess and checkers set. 4. Giffords Circus (www.giffordscircus.com). A Cotswolds institution. 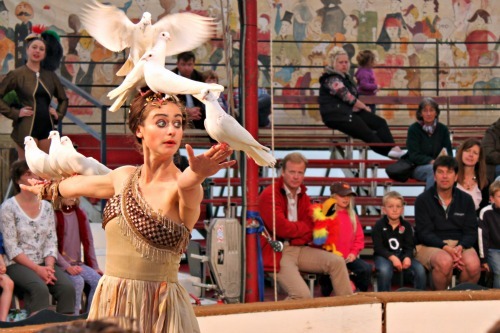 From May through September, this troupe travels to different villages offering a two-hour show that mixes music, dance, magic, horses and comedy evoking the golden age of circus with a modern twist. Kids will be awed by the tightrope walkers and flaming hoop jumps, and parents will love the quaint big-top tent, antique circus cars, and old-fashioned vibe. 5. Bourton-on-the-Water (www.bourtoninfo.com) –This charming village, run through by a small river and crossed by elegant low bridges, is known as the “Venice of the Cotswolds.” A setting so precious and picturesque it looks like a movie set, it is a popular stop for tour coaches. 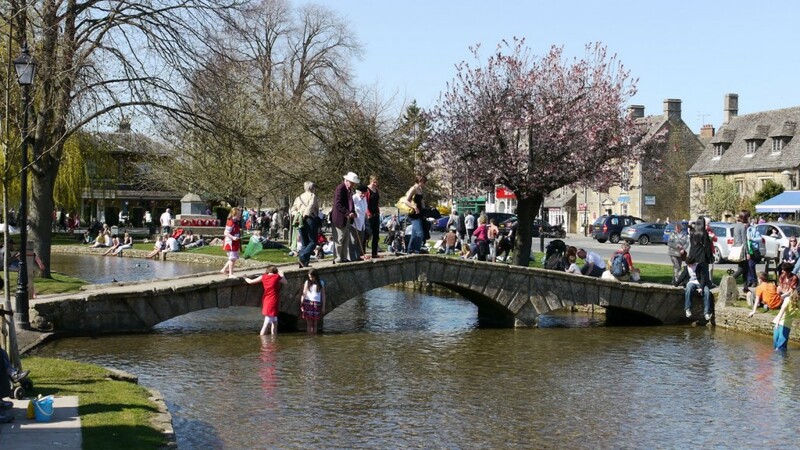 While we try and suggest places off the beaten track, Bourton-on-the-Water makes our list because it offers activities that can be enjoyed in rainy weather—it is England after all! Try the Model Village, an exact replica of Bourton village in one-ninth scale; the Cotswold Perfumery, one of Europe’s very few remaining manufacturers of perfume; the Cotswold Motor Museum, real and toy versions of vintage autos; a small Model Train Museum and toy shop…yes, all a bit touristy but fun and, mostly, indoors! Calcot Manor (www.calcotmanor.co.uk) Set on 220 acres just outside of Tetbury, this former English farmhouse has been transformed into a 35-room ‘country-modern’ hotel (think clean lines and neutral tones, nothing chintz or floral to be found) with spa, indoor and outdoor pools, hot tub and a well-staffed, complimentary kids club that is open seven days a week. The hotel has 10 purpose-built family rooms and suites, most are L-shaped with sleeping nooks for the kids fitted with bunk beds or trundles. The grounds are well suited for walking or cycling (they have bikes in all sizes for guest use). We made it around the hotel’s two-mile trail on foot, seeing butterflies and birds along the way. 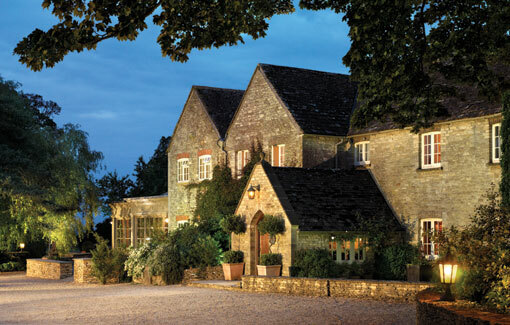 There is a choice of two restaurants on property – a casual pub or the more romantic Conservatory – excellent, farm fresh food at both, and one of the best breakfasts in the Cotswolds with choice of eggs, pancakes, kippers, smoked salmon plus an extensive buffet of pastries, cereal and fruit. Family rooms start at £330 per night. Cotswold House (www.cotswoldhouse.com) is a 28-room property in the heart of Chipping Camden, a prosperous wool-trading town from the 17th century with ancient, higgledy-piggledy buildings of beautiful yellow Cotswold stone. The hotel is one such building, though completely modernized inside, with several cottages around a lovely garden. The cottages are ideal for families, spacious, with massive bathrooms (TV over the bath!) and are equipped with large Bang & Olufsen television/DVD players. Cribs and high chairs are free to borrow. There’s a lovely restaurant with kids’ menu – we enjoyed a proper high tea in the bar – fresh, warm scones so light and flaky they floated into our hungry mouths. Rooms start at £170 per night. Cotswold Inns & Hotels (www.cotswold-inns-hotels.co.uk), is a collection of three and four star properties dotted throughout the Cotswolds, with more traditional décor but updated with flat screen TVs, Nespresso makers, and offering kind, welcoming service. We stayed at two of the properties – the Manor House Hotel in Moreton-in-Marsh and the Hare and Hounds Hotel just outside Tetbury and within walking distance of the amazing Westonbirt Arboretum. Rates start at £120 per night and include a lovely full English breakfast. Emily Goldfischer, a former luxury hotel executive, is a London-based food and travel writer. Follow her at www.twitter.com/em_goldfischer. Nice work Em. When I am next in England, will make sure to visit those places.